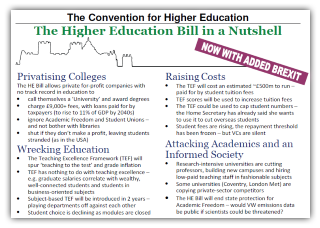 Our main hope of defeating the disastrous Higher Education and Research Bill lies in persuading sufficient numbers of Conservative MPs to vote against it. There may be resistance in the Lords, thanks to objections from some senior scientist peers – but the Lords are not accountable to any constituents, unlike MPs. And since everyone but the Conservatives voted against the Bill on its second reading, and since the Conservatives have resisted any amendments to the Bill in the committee stage, we can anticipate that only Conservative MPs will back it on its third and final reading. Given the government’s effective majority of 16, this means we must persuade a relatively small number of MPs to oppose the Bill. To this end, we’ve prepared a campaign pack containing model letters that can be sent to Conservative MPs, plus a variety of interest groups in their constituencies, with the aim of persuading them to lobby MPs, too. The pack contains full instructions of how to customise and send the letters. Please download it, use it, and circulate it widely, so that it reaches as many Tory constituencies as possible. 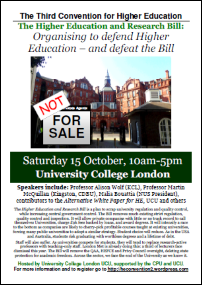 This entry was posted in HE BIll and tagged alternative, argument, campaign, letter-writing, lobbying, mp, university. Bookmark the permalink.